The Islamic State group has claimed responsibility for many of the recent killings, of liberal and secular citizens in Bangladesh. A day after a press club in Bangladesh's Natore district received a letter with death threats to 10 people, including journalists and the vice-chancellor of Rajshahi University, Bangladesh's top police official AKM Shahidul Hoque said that the police can't provide door-to-door security. However, the police in Rajshahi city have said that they have given security to the people mentioned in the hit-list. On Monday, a letter signed by the Islamic Liberation Front â€” a group the police said it had not heard of before â€” sent death threats to some liberals and secular citizens of the country. The police have said that they are taking the threats seriously and investigating the source. "The leaflet bears the name of Islamic Liberation Front (ILF). It said it has launched a mission to kill the 10 people" Natore police chief Shymal Kumar Mukherjee was quoted as saying by Agence France Presse. 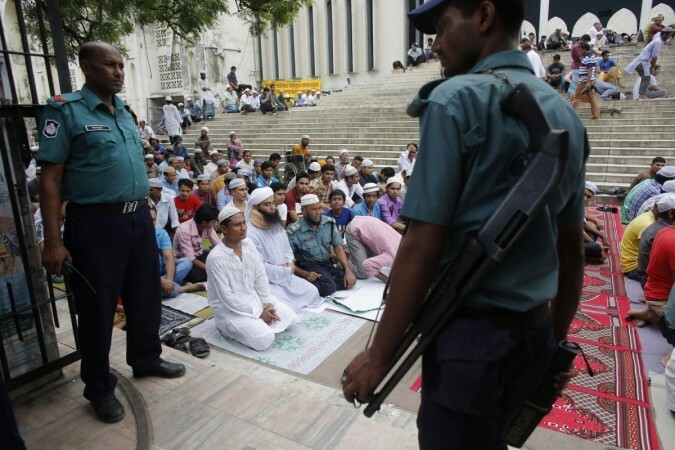 At least four people, including gay rights activists, a Rajshahi University professor and a Hindu man, were killed recently in Bangladesh reportedly by the Islamic State (IS) group. However, Bangladesh continues to deny the terrorist group's presence in the country. Inspector General of Police Hoque on Tuesday was quoted as saying by Dhaka Tribune that "the recent murders are all targeted killings. It is not possible for the police to provide door-to-door security" at a press conference. He also said that militants took inspiration from similar incidents happening abroad, however, he dismissed the possibility of foreign militant group's presence in the south Asian country. The ILF in its letters pointed out its purpose, one of which is to establish an Islamic caliphate in the country.